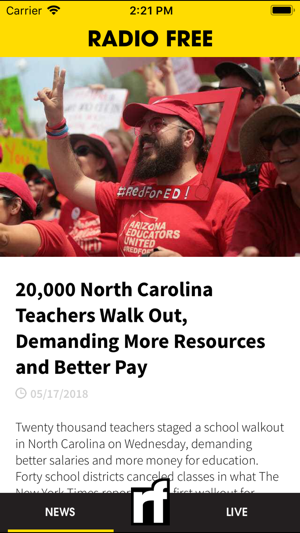 News for People, Not Profits. Radio Free brings you the news without corporate agendas. We compile the news from the most trusted sources and puts them all in one place – making it easier for you to find the news without commercial interests. We don’t take money from corporations, relying solely on individual donations and foundation grants- keeping our focus on people, not profits. To date, we have published over 150,000 articles to an audience of 10 million+ readers, listeners and viewers across the globe. Community media should be representative of the community it serves. Community is at the heart of our mission, so much so that we offer the opportunity for anyone to submit a show for broadcast. By giving people a direct voice within their community, content is relevant and varied demographics are empowered. Bridging the gap between the local voice and the international conversation, Radio Free decentralizes its approach to news by working with small communities. Community members can create content and have their voices heard. Our award-winning syndicated programming bolsters this by reporting on issues other news bureaus avoid. There is a significant correlation between the amount of arts activity in a community and community stability. By providing a free service to the world that is un-sponsored by corporations and advertising, we can get people thinking and working together in local communities as well as internationally. Connecting people through the power of free and open expression helps not only the local communities but the world as a whole. Radio Free is not your typical media outlet. We create and publish on the web, in print, and on radio – all free from corporate sponsorship. Our news is not brought to you by the weapons manufacturers, the pharmaceutical industries, or the oil and gas companies – our news is brought to you by people like you. Our news is news without distractions; long form journalism in the public interest mixed with pieces that showcase diverse cultures and viewpoints. We understand that art and music are important tools to help understand the world – so we exhibit them. We don’t employ limits on article length and we don’t have a financial ‘bottom line’ to worry about – we are simply publishing news for the sake of news. 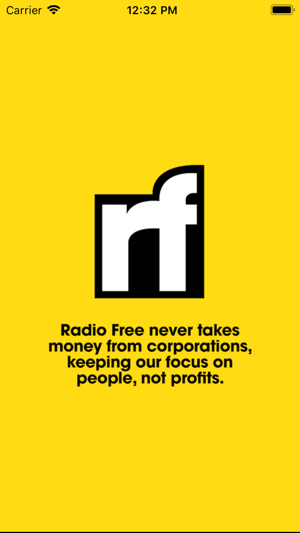 Radio Free provides the news without taking money from corporations, keeping our focus on people, not profits. 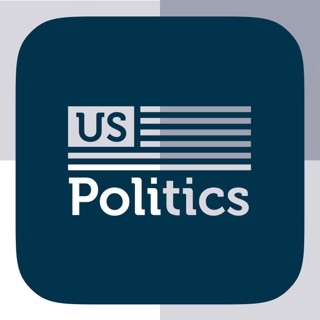 Download the Radio Free app to get quality non-commercial news from sources you can trust. 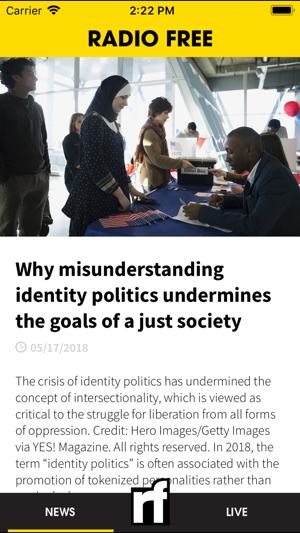 Visit radiofree.org for more information. We've completely rebuilt everything from the ground up. This version of the Radio Free app is now built as a native iOS app, including our live stream, breaking news, videos and audio articles. 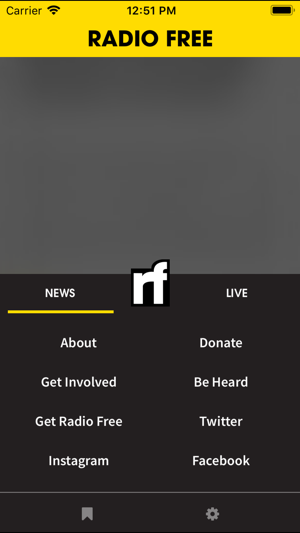 RadioFree is an awesome app that is user friendly and offers a lot honest news information. One of the best parts of the app is that there are no ads bothering you as you scroll through the app. This app is great...it is super easy and functional. It is reputable journalism and the music curation is so good. This is my go-to for headlines and long form stories. 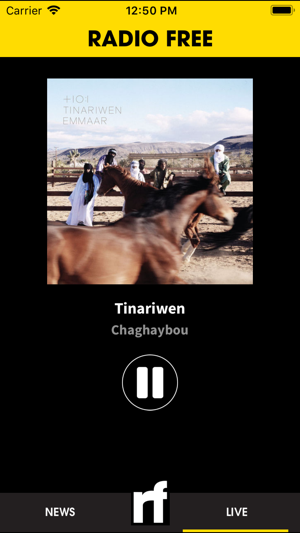 Great app for up to date news and awesome music. It’s also an ad free app!